PayPal is currently offering 25 percent off digital iTunes cards in the United Kingdom, allowing users to purchase iTunes codes for the App Store, Mac App Store, iBooks Store, and iTunes Store at a discount. Under the terms of the deal, an £15 iTunes card drops to £11.25, while a £25 card drops to £18.75. 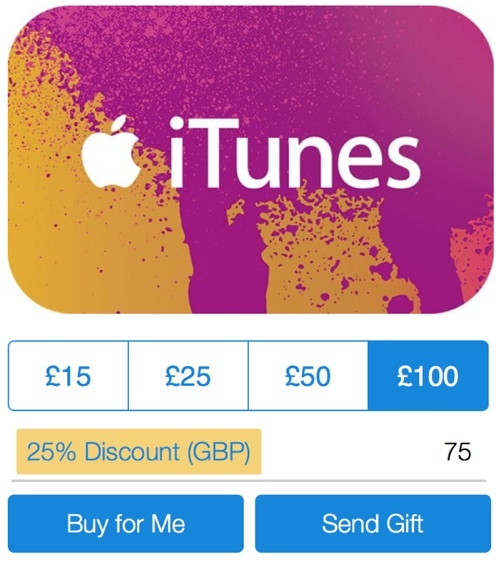 Larger denomination iTunes cards of £50 and £100 are available for £37.50 and £75. Cards are only redeemable in the UK iTunes Store. The offer lasts until Thursday, August 28 at 11:59 BST, but as with all PayPal iTunes discounts, there are a limited number of codes available and discounts will only be available while supplies last. Awesome. Now you can use some of the money you saved to buy more things to put in your forum signature. Always better than buying less money with more money. Here in Germany you can get 20% off somewhere every other week. I'm always holding out for the rarer 33% deals. Once one does it they all tend to follow. It's worth keeping an eye on hotukdeals.co.uk, though the anti apple bias of some members is annoying. Anyone found a way around the 'your payment could not be sent' error? Same here in NZ. iTunes cards can very readily be found for 20-25% off.